Freelance Sword Jockey Eddie LaCrosse is in the wrong place at the wrong time while conducting an undercover investigation on the island kingdom of Grand Bruan. When a poisoned apple kills a member of the queen’s personal guard, Eddie becomes the prime suspect in the murder. He must do some fast talking to keep his head attached to his shoulders. Trying to clear his name and find the real killer, Eddie becomes embroiled in a nasty political scandal. Someone is trying to ruin Queen Jennifer, and they don’t care who they kill along the way. The more Eddie digs, the more twisted the lies become, until Eddie finds himself caught between two opposing armies. The fate of the entire kingdom lies in his hands. Murder, betrayal, and magic—just another day on the job for Sword Jockey Eddie LaCrosse. This book was sent to me by the wonderful people at Tor. Sometimes you just have to relax, let your hair down and read something a bit different than the standard fantasy affair. I’ve never read any of Bledsoe’s work before, and now I wish I had. I didn’t read the back of Dark Jenny before I dove in, which is unusual for me. I just picked it up expecting some odd romance because of the cover art and was blissfully surprised with snappy dialogue, likeable characters and a nice dash of cynical humor all wrapped snugly around a convoluted murder mystery (no nauseating romance in sight, thank you very much). Dark Jenny is the third book in the Eddie LaCrosse fantasy series. Each book is a stand alone, which is a benefit for those of us who had never read any of Bledsoe’s work before. Furthermore, there is no real agonizing waiting period at the start of Dark Jenny where the author sets up the world and characters. If one thing is true, it’s that the world Bledsoe created pales beside the witty, cynical and sarcastic Eddie LaCrosse. It’s obvious LaCrosse is the focus of the book, with the world standing second fiddle. Dark Jenny is told in the first person, but for this book I wouldn’t have it any other way. While I did, on occasion, feel like I missed something with the lack of three-dimensional world building, LaCrosse’s likeable character quickly made up for anything lacking. That being said, Dark Jenny is highly character driven. While this is enjoyable and allows for easy absorption of the plot by the reader, it does detract slightly from the world and secondary characters that enter the novel. However, Lacrosse’s voice doesn’t overpower to an unrecoverable extent. The plot in Dark Jenny is incredibly straightforward. Bledsoe’s quick pace takes the reader from zero to murder in almost no time flat. In a book that clocks in at slightly over 340 pages, the fast pace is necessary. However, what impressed me with this was that Bledsoe not only managed a fast pace with some form of action on nearly every page, but he also kept the plot tightly focused. That’s something many authors seem to struggle with when the plot moves from a crawl to a sprint. 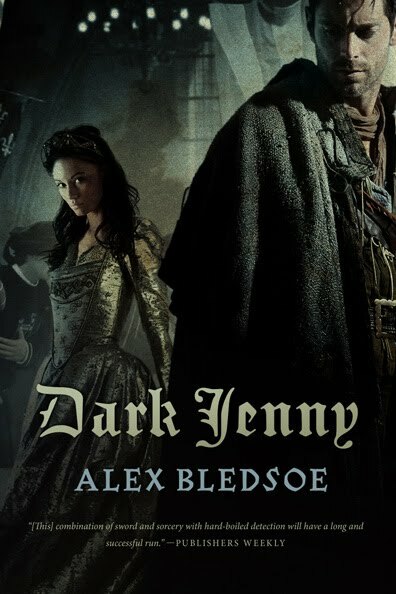 Bledsoe keeps the Dark Jenny relatable, adding in old tales that reminded me quite a bit of Arthurian legends and lore with events that take place on an island that, from the description, reminds me quite a bit of the British Isles. Not only that, but sprinkled throughout the book are references to modern day concepts that we don’t generally see in fantasy. An example of this would be a private investigator for hire (also known as a “sword jockey”). These aspects, put together, ensure that this book could be quite a hit with individuals who may not be so well read with fantasy, or may find fantasy off-putting. It also means that many tried-and-true fantasy readers will be able to enjoy a fantasy book with many new and refreshing twists on typical fantasy worlds and cultures. That being said, this book does face some problems. This is a murder mystery, and being such one can expect a convoluted chain of events and characters. Usually they all manage to add up somehow, but Dark Jenny fell slightly short of that mark. Some of the details never quite worked themselves out. Also, some of the plot seemed a little overly convoluted and thus, at times, unbelievable (I won’t go into details or offer examples on either of those points, as I don’t want to give anything away.). This did manage to put a slight damper on the book as a whole, but not overly so. It was still a highly enjoyable read if I overlooked those aspects that seemed out of place, or were left without being fully resolved. All in all, Dark Jenny is unlike any fantasy novel I have ever read before. It manages to blend modern concepts, well-known fables and likeable characters around a unique murder mystery. LaCrosse is a character that is easy to relate to and incredibly fun to read about with his cynical voice and the in-over-his-head situations he finds himself in. His first person telling of this tale makes Dark Jenny even more engrossing. The plot is incredibly fast paced and there are plenty of twists and turns to keep readers guessing. If parts of the plot weren’t completely believable, and aspects of it didn’t quite resolve by the end of the book, it’s easy to overlook with everything else that is offered here. Fans of The Dresden Files should be aware of this one. The blend of fantasy and detective work has a very similar feel. Dark Jenny is a short, easy page-turner and an overall absorbing tale that was a wonderful vacation from many other books out there. Fans of fantasy, and crime novels will easily devour this one. Bledsoe can be assured that I will eagerly read the other books in this series. Dark Jenny is the third stand-alone novel in the Eddie LaCrosse series. They just can't make up their mind with the LaCrosse covers, can they? I read the original Sword-Edged Blonde from Night Shade Books and really enjoyed it. I have been wanting to read the second one, but it is one of those series that continually slips my mind. I liked the first book a lot. Still need to read book 2 before I read Dark Jenny. Or maybe I should just skip ahead to the new one. Sounds like a good book to read between Malazan books. I have not read either of them myself, but if you liked this, chances are you might also enjoy Glen Cook's Garrett, P.I. series which, judging by the description, does something very similar. I'm a big fan of Eddie LaCrosse. I loved The Sword-Edged Blonde and Burn Me Deadly a lot. Eddie is a character after my fancy. My reviewer copy is on the way…. Glad to read that you liked Dark Jenny and you will not be disappointed by The Sword-Edged Blonde and Burn Me Deadly. I don’t think I’ve ever picked up and started reading a book without reading the back cover first! You are so brave. Glad you loved it – I haven’t tried him yet either but I have bought several of his books during the Borders closeout sales. I need to hop to!